Software is an increasingly important part of various products, although not always the dominant component. For these software-intensive systems it is common that the software is assembled, and sometimes even developed, by domain specialists rather than by software engineers. To leverage the domain specialists’ knowledge while maintaining quality we need testing tools that require only limited knowledge of software testing. Since each domain has unique quality criteria and trade-offs and there is a large variation in both software modeling and implementation syntax as well as semantics it is not easy to envisage general software engineering support for testing tasks. Particularly not since such support must allow interaction between the domain specialists and the testing system for iterative development. 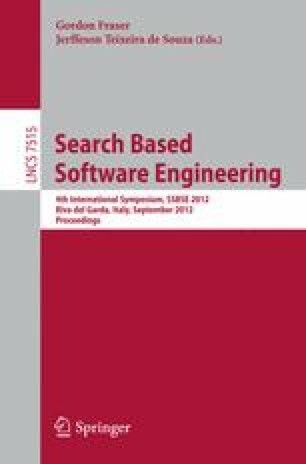 In this paper we argue that search-based software testing can provide this type of general and interactive testing support and describe a proof of concept system to support this argument. The system separates the software engineering concerns from the domain concerns and allows domain specialists to interact with the system in order to select the quality criteria being used to determine the fitness of potential solutions.